We are very proud to announce that David has started his new position as a research professor at University of Applied Science Flensburg (HS Flensburg). We congratulate you and wish you all the best for the new opportunities. We believe that this step will boost the creativity and the innovative ability of sowento and are happy that you are a part of us. Thanks! Since September 2018, I am now working mainly as a research professor at University of Applied Science in the lovely city of Flensburg at the Baltic sea. I am the third professor at the Wind Energy Technology Institute (WETI) which is active in both research and teaching in wind energy with a close collaboration with industry. 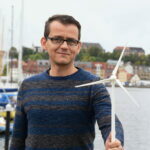 During a meeting of the European Academy of Wind Energy (EAWE), when the HS Flensburg became a member of the academy, I got aware of the open position. What is your focus at WETI and how does this fit to sowento? At the WETI, I will be teaching in the international master programme “Wind Engineering“. Further, I plan to dedicate my research time in near future to open issues in lidar-assisted control, systems engineering, and floating wind turbine control. Since sowento aims to continuously advance through a close link to research and education, my profession perfectly fits to my involvements in sowento. What are your main tasks at sowento now? As part-time work for sowento, I will coordinate the strategic development of the lidar-assisted control activities, support our clients in realizing their control projects and work as consultant for different stakeholders in the wind energy business. Thank you! We wish you all the best for the new tasks. Copyright © 2019 sowento – Powered by Customify.